As one of the most trusted names in global real estate development, Hines sets a high bar for quality in design. The company’s regional headquarters needed to support its high-performing team and reflect the dynamism of its new location. PDR rose to the challenge and offered a high-design, high-impact solution. Towering above downtown Houston in its own creation, the state-of-the-art high-rise at 609 Main, the new Hines workplace has an unsurpassed vantage of the city, and an innovative program that will support its teams now and into the future. Teams now have increased opportunities to casually connect in refreshment areas, and intentionally collaborate in workrooms and flex spaces. It’s a recipe for culture building at a 2/3 private office to 1/3 open office design ratio. The new workplace celebrates the influential structures the Hines team has brought to Houston and the region. The geometry of the lighting and material finishes references the geometry of 609 Main’s building design. 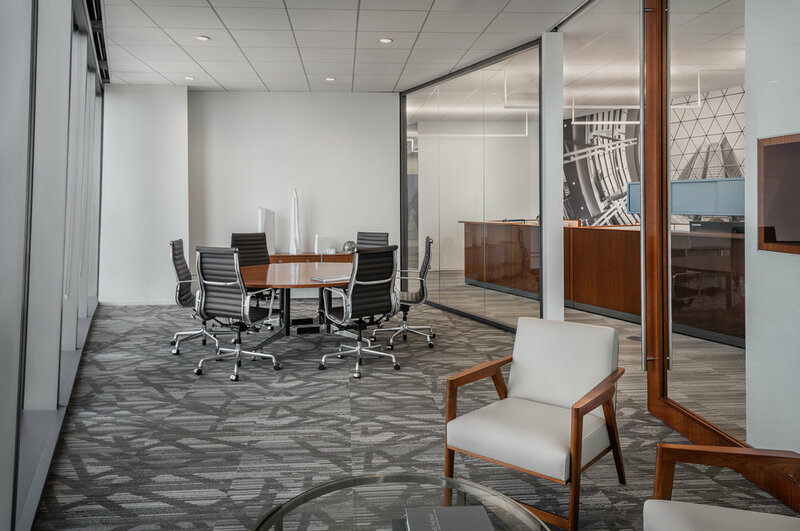 Natural daylight and transparency between adjacent rooms contributes to the connectivity within the office — a sentiment that also extends beyond the glass curtain walls, and into the cityscape. Design and culture aside, efficiency and future flexibility are two other major project attributes. Practical choices to reuse existing workstation and office furniture, and to install demountable partitions at office fronts underscores the project’s efficient use of resources and its ability to adapt to the changing needs of its occupants. Hines' tagline, "intelligent real estate investments," is evident in its smart new regional headquarters.